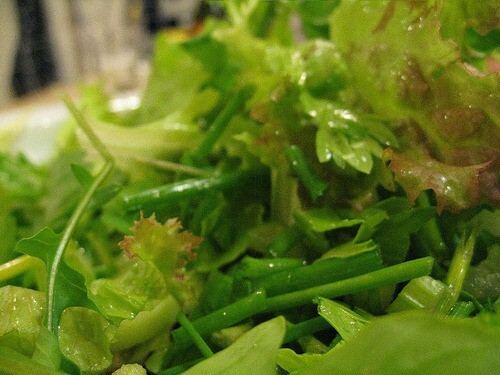 One of the most challenging things for home cooks is salad preparation. New mothers and people on a diet have an especially hard time getting fresh vegetables, since the vegetables usually can’t be eaten straight from the package unless you pay for the privilege. But you can prepare a large salad, or just some cut up vegetables, on a weekend or whenever you have a chunk of time. The salad will keep for several days to a week. Keep a jar of homemade dressing to add to the salad just before serving. Washing and peeling vegetables somewhat reduces their nutritional value. But it’s a lot better than not eating them at all. If you’re lucky, you can go into your garden and choose what you need before each meal. But most of us buy vegetables every week or so. Leafy greens like lettuce, spinach, kale, or celery. Herbs like parsley, dill, fennel, or coriander. Red, yellow or green onions. Root vegetables like carrots, radishes, or kohlrabi. Peppers, but be sure to remove the membranes and seeds. Use with caution: Cucumbers. These contain more moisture and will not keep as long. Cut to the desired size. Cutting larger sizes means less work, and preserves more nutrients. Add all the vegetables to a glass or ceramic bowl and cover well for best results. Add just before serving: Tomatoes, avocados, olives, cooked beans, pasta, cooked vegetables, grains, and animal proteins like cheese, hard-boiled eggs or meat. I’ve read that if you cut tomatoes very small they will be okay, but I haven’t tried it. Dressing: Make a dressing with one part olive oil and one part vinegar or citrus juice. Add herbs, garlic, and spices as desired and store in a cruet in the refrigerator. Your body absorbs more vitamins when vegetables are eaten with oil. And you’re more likely to actually eat the salad when you add a judicious amount tasty dressing. Add only to the portion you are about to serve or eat. When you see that colorful salad sitting in your refrigerator you won’t be able to resist. How long do you find that cut (typical Israeli) lettuce keeps in the fridge? Ilana, lettuce keeps about 5 days to a week. These tips are very useful. Bravo to you for coming up with so many useful posts. I also find it’s best to cut the vegetables in large pieces if I’m cutting them in advance. Then before I serve a salad, I cut them smaller if necessary. I keep chopped parsley for 2 or 3 days in a separate container and use it in salads and soups as needed. I rarely cut tomatoes in advance. I don’t think that dicing tomatoes very small will help them keep. If I must prepare Israeli salad a few hours ahead, I keep the diced tomatoes in a separate bowl and add them to the other vegetables just before serving so they won’t make the other vegetables watery. Also, a question: Do you really make your dressing with 2 or 3 parts vinegar to 1 part oil? In France I learned to do the reverse: 3 parts oil to 1 part vinegar, and over time I made myself get used to equal parts. More vinegar than that comes out very acid for our taste, unless I’m using very mild vinegar like rice vinegar or eating it with sweet vegetables like beets or carrots. Faye, I’m going with your formula. Thanks for reading and commenting, as always. I find if I store washed lettuce and herbs in closed containers with a layer of paper towels on the bottom they hold much longer. Also, if you remove the seeds from the tomatoes the salad will not get as watery. Finally, get your kids to help. My kids will happily cut vegetables for me while I deal with the rest of the meal. Thanks for those great tips, Rachel!